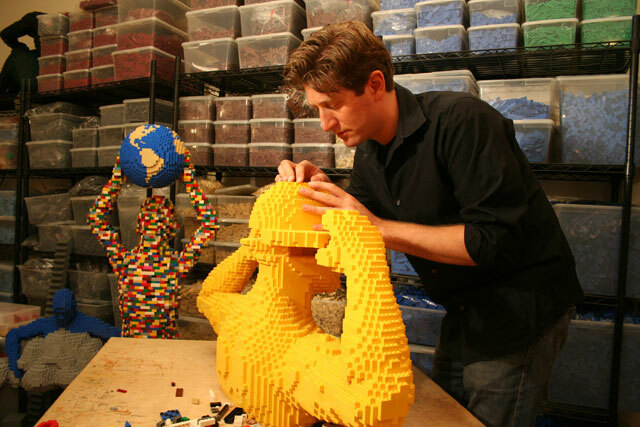 Nathan Sawaya is a Brick Artist. That’s his trademarked title, according to his website. And no, it’s not a fancy name for a builder or labourer, it reflects that Nathan makes his art not with charcoal, or paint, or even sprinkles, but with LEGO bricks. Nathan currenly has over 1.5 million bricks in his New York studio – you can see some of them in this pic from his website, colour coded and boxed in a way that would put even the neatest parent of a toddler to shame. Nathan’s work is incredible. Like this amazing man-inside-a-man (clearly not its official title, but my own) featured on Nathan’s Facebook page. I think this is why Nathan’s so clever – he can use the brightly coloured bricks of our childhood to make a giant dinosaur (currently on exhibit in Taipei) or rainbow hearts or giant bodies. 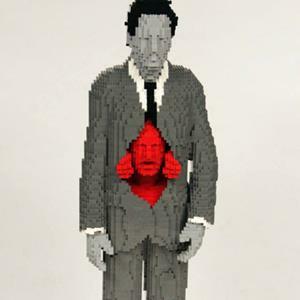 And then, he can use Lego bricks to make a sculpture like this more serious and muted man shuffling along living a sort of half-life in his corporate suit, while inside of him is that lively, passionate red man just trying to get out. At least, that’s how I see it – there’s always the chance that it’s just an alien themed sculpture of the red people overtaking the humans. Either way, I like it! 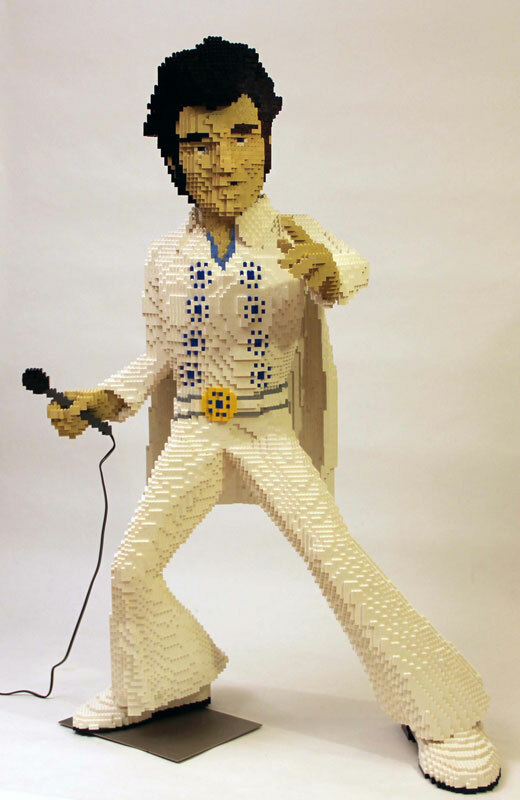 There are so many amazing brick sculptures in Nathan’s collection, it’s tough to choose what to include here. So I’ll finish with this, which is surely the dream bedroom of many children (lack of comfort aside, it would totes impress other little people who visited). 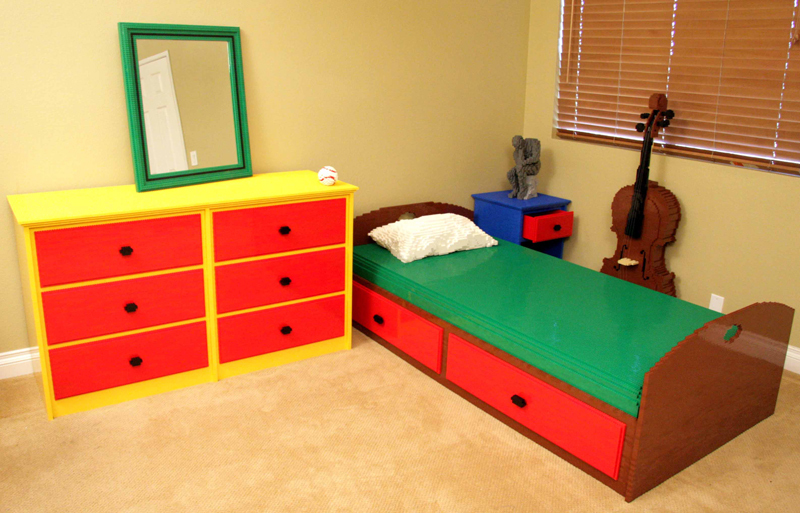 Nathan was “commissioned to create a display of how a bedroom would look entirely out of bricks” – not one to do anything by halves, the drawers open and the brick pillow is removable. Oh yes, and that’s a Lego cello there, against the wall. And a Lego model of The Thinker. Just because. If you want to check out more of Nathan’s work – and it is well worth a look – his website is here and his Facebook fan page is here. How cool is that? I can’t even create 2D images that come close to this – imagine being able to do it in 3D?